Located right in the heart of downtown, Richmond Marriott features a flawless combination of sophisticated style and modern charm. Connected via skywalk to the Greater Richmond Convention Center, our hotel offers a prime location that puts you just steps from the city's historic past, including the Virginia State Capitol. Guests can experience the city's unique ambiance by taking the complimentary shuttle to nearby dining and entertainment venues. Our stylish guest rooms provide contemporary amenities, including high-speed Wi-Fi, flat-screen TVs with premium movie channels and plush bedding. Upgrade to a concierge-level accommodation for access to our exclusive lounge. With over 26,000 square feet of event space, our venues are the ideal location to host corporate events, conferences and wedding receptions for up to 2,000 guests. Diners love T-Millers Sports Bar & Grill, serving a mouthwatering selection of dishes from breakfast until dinner. Turn any stay into a relaxing getaway at Richmond Marriott. T-Miller's Sports Bar & Grill: From breakfast through dinner, T-Miller's Sports Bar & Grill is the perfect place for restaurant-quality meals in a casual, laid back environment. 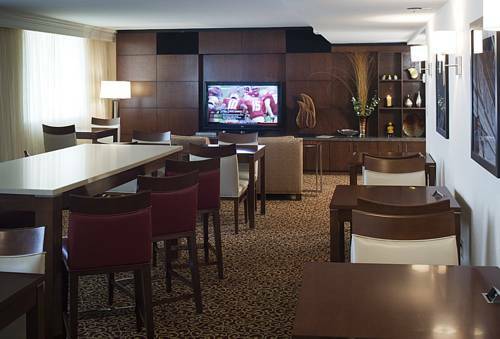 Cheer on your favorite team while partaking in one of our savory dishes or handcrafted cocktails. Starbucks : Before you start your day in downtown Richmond, stop by our on-site Starbucks for a specialty coffee beverage or a quick snack to get your morning off to the right start. You'll find it conveniently located in our hotel lobby. Liberty Bar: Combine a traditional American cuisine with a full-service bar and you have this dining establishment, open each evening for dinner service. With a varied selection of dishes and signature cocktails, there's no better place to unwind after a long day.